My husband and I touched Louisiana soil yesterday for the first day of our house hunting, aka "re-con" trip. We were cautiously optimistic having no frame of reference in the area. 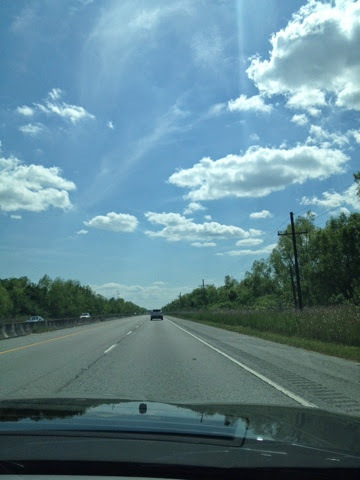 We looked up into the Louisiana sky and saw two gators in the clouds. We are considering it a good omen, rather than a warning as the day went down hill from there. We'd been warned that the road leading to our new hometown was a tad depressing. This warning was a bit of an understatement. Poverty is the only word that can describe the run down homes that lined the roads of this country setting. We continued through the area taking deep breaths and knowing that this wasn't a part of the area we'd be searching. We were warned, after all. We were happy to reach our hotel. It is like any other with the exception of the "idiot" behind the front desk. She politely helped us get checked in. My husband made polite conversation revealing that we were on the search for our new homestead. I asked her if she could suggest any good areas to narrow our search. She said "no it is getting really bad around here." I was confused and inquired about what she meant, thinking obtusely that it was getting more populated and too crowded for a country girl. She instead informed us all about the crime rate and shootings taking place all over the area. I jokingly asked her if I should get a gun. Without a hint of irony, this woman encouraged the purchase stating boldly that her ownership was already in the works. My husband wanted to slap her after seeing the fearful and discouraged look on my face. He quickly talked me down wondering why someone would frame their hometown this way. After a quick wardrobe change, we jumped back into the rental and cruised to the location of several listings we've been viewing on zillow. As we drove along, we saw families fishing. We saw beautiful open spaces. We saw Easter parties getting cleaned up. My husband saw my smile resurface. We will ignore our first impression and continue to know that we will make this experience great. Hopefully our realtor will frame this place a bit different than that front desk girl. With any luck tonight's dinner won't need to include numbing cocktails and will instead include celebratory drinks. Wish us luck!